← Info About Buying Tix from 3rd Parties. SHAMBHALA 2011 TIX SOLD OUT. 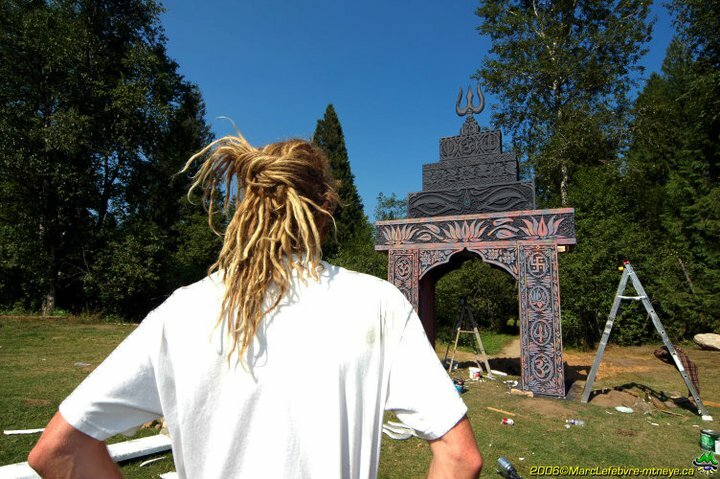 Ever wonder who’s behind the magic of the Shambhala stages? We thought you might! We conducted a little interview with each of the Stage Directors, to give you some insight into their stories. 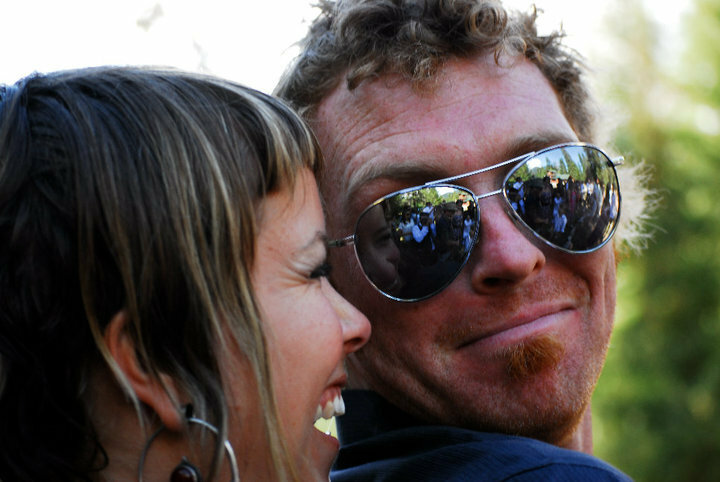 For today’s interview, we have Mike Paine, aka Hoola and his wife Sara. Hoola and Sara are The Pride, and are the Stage Directors for the Living Room stage. Mike DJs under the name Hoola Hoop…among other names. Sara is know as DJ Lion-S. Enjoy! Britz: How long have you been with Shambhala? The Pride: We have been with Shambhala since before its inception. 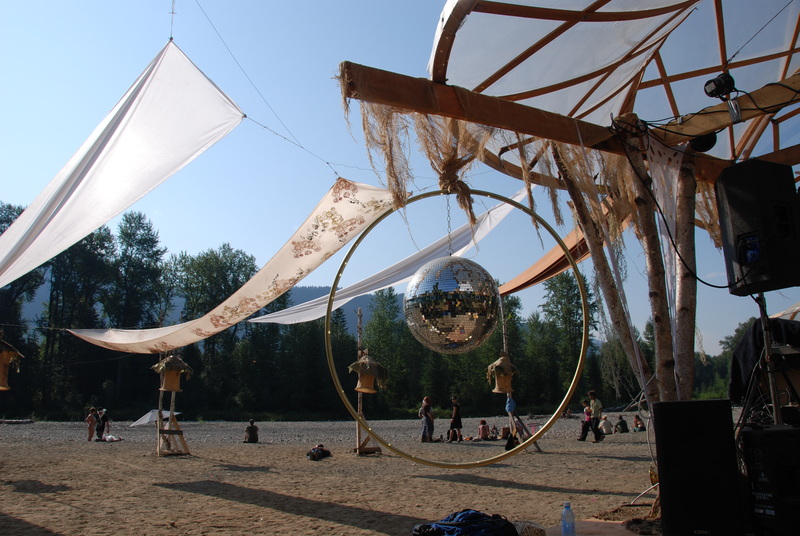 The first “electronic party” held on the Salmo River Ranch was called “Uplift”… I think it was the year before shambhala, or maybe the same year in early spring. It was a small party, only a couple hundred people at it. Britz: What was your role with the festival before you became a Stage Director? The Pride: The first few years, we just played music. It was fun and chaotic because nobody knew when they were playing and nobody cared. 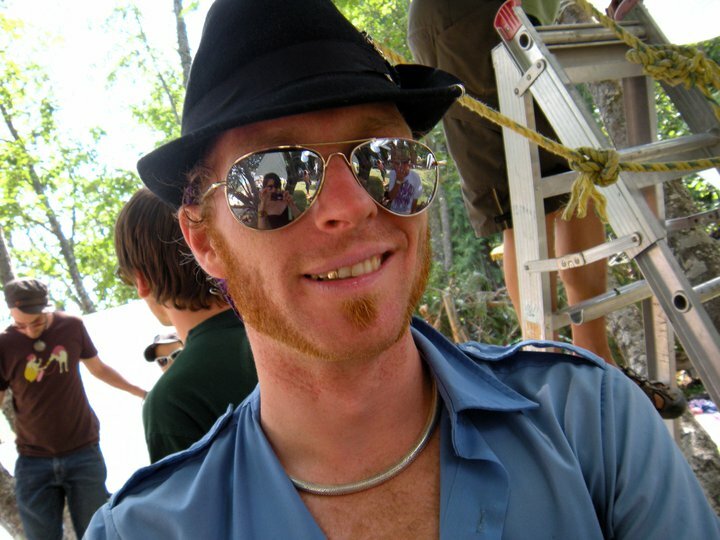 By year three (2000), Hoola was managing the DJ schedule for the three stages that existed at that time; The Jungle Pit (now Rock Pit), Main Stage (Pagoda) and the Fractal Forest. From year 4 (2001) until the end of year 10 (2007), we did all the bookings, scheduling, talent management and International Talent hosting for all 6 stages. In year 4 we also took over the beach and called it the Living Room and still manage it presently. We retired from Talent Management in year 10, as it grew to be “too big of a job” for 1 person, and took the opportunity to focus just on the Living Room Stage. Britz: How long have you been a Stage Director? The Pride: I guess we started managing the Living Room in year four, so that would be 2001, I think. I just realized that its 2011 now and its been 11 years! 1111. Britz: What was your favourite Shambhala Moment? Hoola: My favourite moment would have to be the last time I played the Fractal Forest. It was a really warm – almost hot – night. About 20 minutes into my set, a really cool breeze came through the stage. Right as it hit me, three hoola girls turned on their LED psy-hoops and formed a triangle formation; one behind me, one in front and Holly Hoops was up at the top of the pyramid, where she was being filmed, and a live feed projected onto all the screens throughout the Forest – 360 degree visuals. It was so sureal. It felt like time and space were one and nothing. A Hoola Fractal, literally. It was magical. Then, my mom and sister showed up and that just topped it off – hangin’ with them in the DJ booth surrounded, by the perfect mayhem that is Shambhala. Sara: It was the year Shpongle played (2006). I was sitting up against the old growth tree in the Living Room, mid-day, sun was shining beautifully…. Wassabi Collective was wrapping up their set on the beach stage and we were getting ready for Simon Posford to begin his epic beach set later that afternoon. Masses of people were beginning to gather by the river already. As Wassabi was ending their “Flowers” encore on the beach, the March Fourth Marching Band came marching around the corner entering the living room from the grassy back end of the stage! It was a full on spectacle with stilt walkers and circus freaks adding to the multi dimensional musical environment. 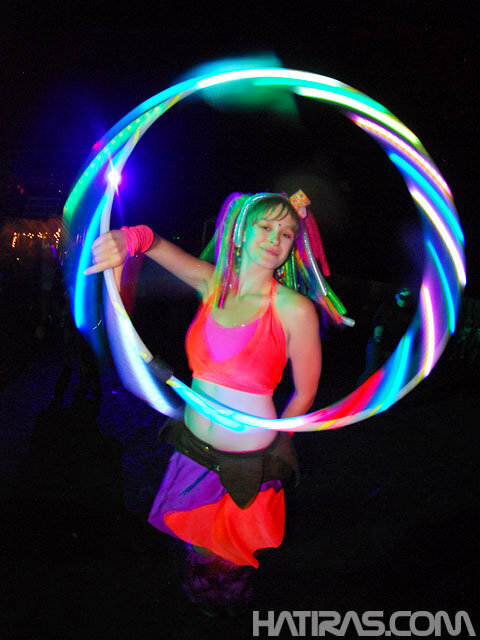 Just as that happened, I looked up to find one of the Dream Science circus performers (a beautiful female gymnast) doing an aerial performance in a hoola hoop suspended up in the sky in between the 2 old growth trees in the Living Room!!! It was all timed out so beautifully! The colors were vibrant and and everything seemed to sync up perfectly, sound, color texture. It was one of those divine moments that felt so psychedelic yet I was completely sober. 🙂 I will never forget it. 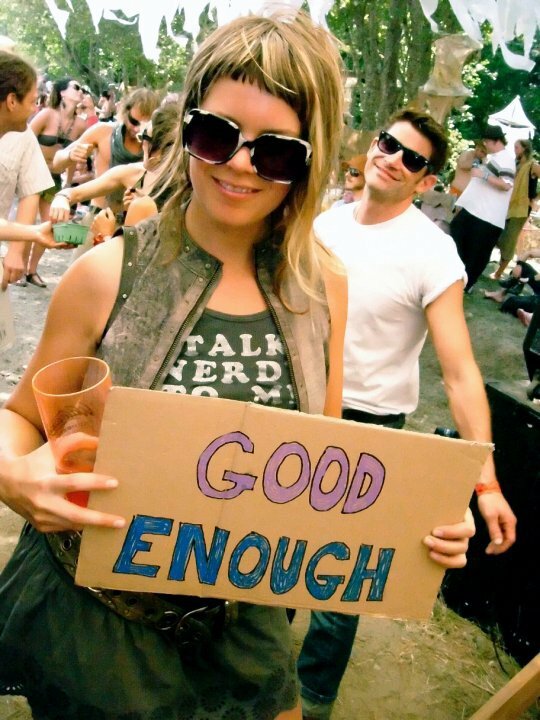 Britz: How did Shambhala change your life? The Pride: It’s not how it’s changed our lives so much as it’s how WE have helped change the lives of thousands of others. Its been 14 years of partying at what I still think is quite possibly the best show onearth, and it feels like just another year gone by. It’s New Year’s weekend for us. Britz: What would you like to say to the fans of your stage? The Pride: We’d like to thank all the people who are a part of it and the people who come and enjoy it, because it would be nothing without them. It’s a community stage and we really try to keep the Kootenays involved as much as possible. When your ready to chill, you know where to go. We also continue to honour our loved ones that we have lost starting with Osprey and then many more that we have lost over the years and truly miss. Way too many to name here. “The LIVING ROOM (Kootenai ROOTS)) BEACH STAGE run by the PRIDE. The Pride is YOU. The FAMILY re-union of LIONS that gather every summer out of natural instinct to their favorite watering hole to cool off and CELEBRATE present LIFE as we know it. It is a sanctuary for the greater KOOTENAI family. We have come to realize that the Living Room has a much deeper meaning to the name. It is the magical setting where we can celebrate the LIVES of LOVED ones lost over the years. Alot of whom thought of the living room as their family and home. Want to know more? Visit the Living Room Stage Page on the website! It's all about the people on the dancefloor. This entry was posted in Community, Posts by Britz and tagged 2011, BC, BLK RSN, Community, Creativity, Culture, DJs, Get Involved, Giving, Gratitude, history, Hoola, Inspiring, Kootenays, Kutenai Roots, Life Changing, Lion-S, Living Room, Local, Love, Music, Nelson, Salmo, Salmo River Ranch, Shambhala, Shambhala 2011, Stage Directors, The Pride, Vibe, Vision. Bookmark the permalink. Thanks for the good work all these years. I will miss y’all this year, but I’ll get my east side family vibe at Open Mind. Luvin’ ya! this is my chance to say to you Happy birthday Hoola:) what a jewel you are and thank you so much for being you . Being part of the team this year at sham was very special , it made my shambala a total bliss!